I'm glad Target spells "macaroon" the American way. When I've reviewed "macarons," it just feels wrong each time I type the word. Not only did Archer Farms get the spelling right, but they got the taste right, too. There's definitely a coconutty sweetness about this cereal, and maybe even a hint of macaroonishness as well. 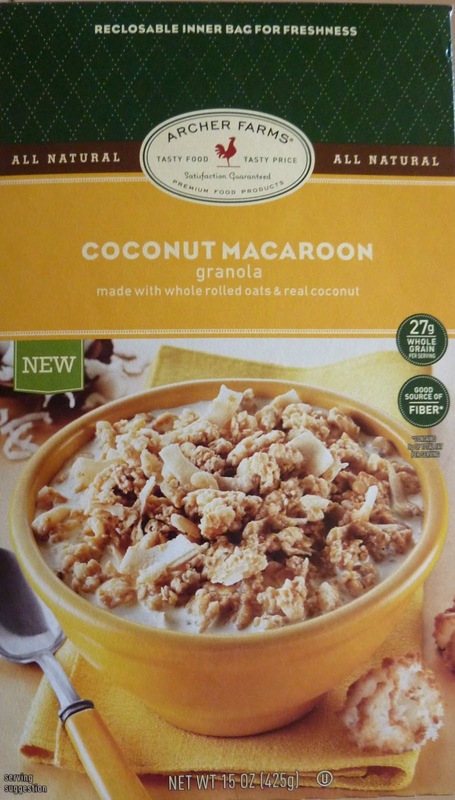 Of all the exotic cereals I've tried from AF, I think this one might take the cake, er...take the macaroon? I've reviewed eight of them now, I think. To find them all, just click on the "Breakfast" label in the side bar and scroll down through the reviews or just type "cereal" in the search bar near the top of the page. There are actual bits of coconut in this cereal, and it's perfectly sweet. Nice and dessert-ish, but not over-the-top, rot-your-teeth-out, death-wish kind of sweet. You definitely won't have to add any extra sugar, but you won't feel sick after eating it, either. I give this cereal 9 out of 10 stars. I LOVE this cereal and purchased as many boxes as I could find when I saw the dreaded "clearance" sticker on all of the boxes remaining in stock. I've called Target to see what's up, and they couldn't tell me if if was truly being discontinued or if it was just being rebranded / repackaged, etc. Generally speaking, it appers, that the Archer Farms brand is being phased out in favor of their new "Simply Balanced" line of foods. Maybe it will be reintroduced under this label? I found your blog when I was online trying to see who else makes this cereal -- it's distributed by Target, not made by Target, so there must be a similar product out there somewhere. Would love to be able to keep buying it! The "American" way? Macaron isn't an alternate spelling for macaroon, they're two completely different things.